Managing certificates during a time of key size migration can be difficult. Website or production outages can be costly and have a negative impact on business. 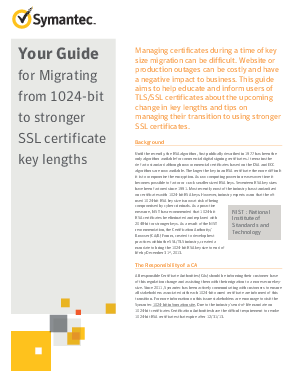 Download this guide to help educate and inform users about TLS/SSL certificates in order to understand the upcoming change in key lengths and receive tips on managing their transition to using stronger SSL certificates.